ww2dbaseShalva Loladze was a pilot in the Soviet Air Force when the Germans turned against their former allies. In 1942, Captain Loladze was shot down over Ukraine and became captured. 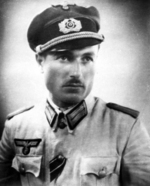 He was given a choice between being imprisoned in a prisoner of war camp or to volunteer in the "Georgian Legion" of the German 822nd Infantry Battalion; he chose the latter. Given the rank of Leutnant, he was ultimately deployed on the island of Texel in the Netherlands. In Mar 1945, he learned of German plans to deploy the Georgians on the mainland in defense against the advancing Allies. Refusing to risk their lives for the Germans, he planned the mutiny that was carried out shortly after 0000 hours on 6 Apr 1945. He was killed in fighting on 25 Apr 1945. He was buried at the Georgian War Cemetery of Texel. 16 Apr 1916 Shalva Loladze was born in Georgia. 25 Apr 1945 Shalva Loladze was killed in combat on Texel, the Netherlands. It was the 822 instead of 882 inf. Bat. Thank you, Pieter-Jan, it has been corrected.